My grandmother makes the best spaghetti sauce. It's a recipe that I'm sure I will never perfect because MeMe doesn't measure her ingredients. It's a palm-full of this and a shake or two of that. I was taught to make our family sauce by my oldest sister while visiting her and her family for the birth of their son. She has come up with her version of the recipe and when I returned home I set out to make mine. Meem's recipe includes browning meatballs and italian sausage in a frying pan and allowing them to finish cooking in the sauce as it bakes in a roaster in the oven. I've found that when I make it without the sausage and meatballs it doesn't taste quite like Meem's. I've fiddled with the ingredients and have come up with a recipe that I love and is close to the way I remember it tasting throughout the years. I don't currently own a roaster, so I usually let my sauce simmer in the crock pot until the meatballs and sausage are cooked through and the flavors have all simmered to perfection. 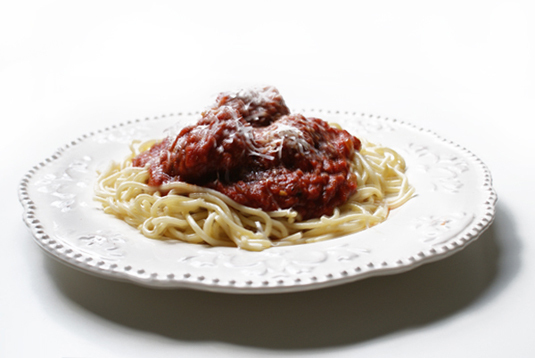 I use red wine in my sauce, which my grandmother does not, but I like the flavor it adds. Remember to always use a good wine to cook with. They experts say to never use a wine in your cooking that you wouldn't drink, so quality is key. Finally, there's a little trick that I learned from MeMe when it comes to the italian sausage. We use sweet and hot, so to differentiate between the two, cut the hot sausage in small pieces and the sweet into long ones. That way you know what you're getting when you finally dig in! I swear I could eat this sauce out of a bowl like soup! So, so good. In a large bowl, combine the breadcrumbs, ground beef, parsley, parmesan, egg and garlic powder. The best way to do this is with your hands. Shape the mixture into 12 meatballs. 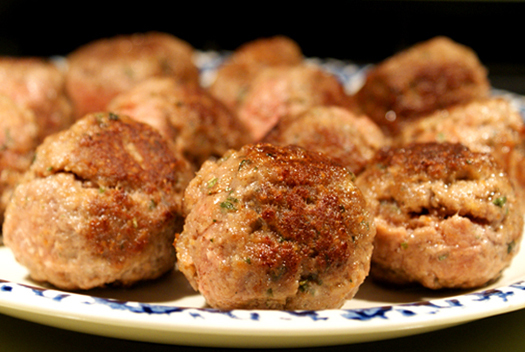 In a large frying pan over medium high heat, heat the olive oil and brown the meatballs on all sides. Remove from pan. Add the italian sausage to the pan and brown on all sides. Remove from pan. Reduce the heat to medium and add the chopped onion and the garlic to the same pan, adding a little more olive oil if needed. Saute until the onions are translucent. Transfer onions and garlic to a large roaster or large oval crock pot. Add the crushed tomatoes, tomato paste, basil, oregano, parsley, italian seasoning, garlic salt, pepper, sugar and wine to the roaster or crock pot and stir until all ingredients are well mixed. Add the meatballs and sausage to the sauce, making sure they are all completely submerged. Bake the sauce, covered, in the oven for 2-3 hours at 350° or 4 hours on high in the crock pot. Stir occasionally while it cooks, carefully as to not break apart the meatballs. Test the meatballs and sausage for doneness and cook for additional time if needed.